If you are new to the world of CBD (cannabinoid) oil and you have found this review, then congratulations! You are clearly interested in the best of the best with PureKana. If you have a bit more experience in the CBD world and you haven’t heard of PureKana before, then where have you been!? Seriously, you must have been living under a rock and using that same rock to conduct your research too! These guys consistently produce some of the best CBD based products on the market. We have loved every single one we have had the pleasure of reviewing so far. 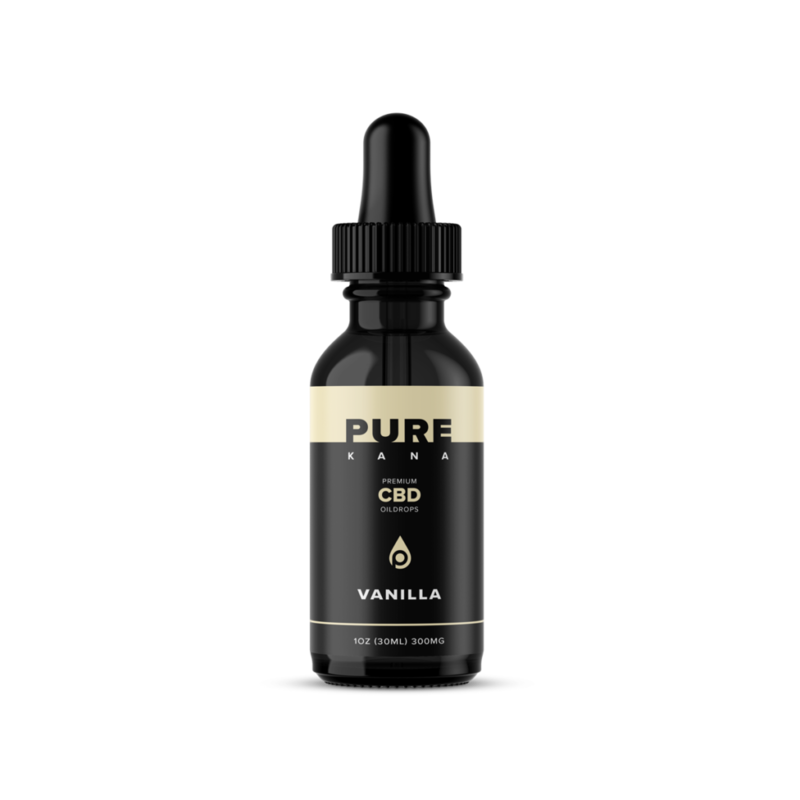 Today we are looking at their Vanilla Flavored CBD oil (300mg strength), and it’s certainly a welcome addition to their existing catalog. We will find out a bit more about who PureKana are, review the quality of the oil, look into its effects, benefits and the conditions it helps to treat before letting you know our final thoughts and rating. Based in glamorous Los Angeles, California, PureKana has made it their mission to become the industry leaders when it comes to the hemp CBD marketplace. They want to educate people all around the globe on the incredible benefits of CBD and make top quality, affordable, CBD based products easily available. Legal across every state in America, they have a wide range of products for you to choose from, including oil, pill capsules, sprays and creams. They have a nice line in delicious edibles too such as gummy bears and peanut butter. They even have products aimed at your pet if your furry friends want in on the action too. No matter how you prefer to consume your CBD, PureKana have you covered. The PureKana brand is also a seal that signifies quality. They guarantee that absolutely no pesticides, herbicides or chemical fertilizers were used in the production of their hemp and it is completely non-GMO. All their products are fully tested by third-party scientists of the highest level, so you know they are 100% safe and legal. On receiving the Vanilla flavored oil, the first thing that struck me was the packaging. Its black labeling looks sleek and sophisticated. Very cool. When I try it, the oil looks super smooth coming out and smells sensational. Seriously, I was tempted to squirt a bit on my carpet the aroma was that good! This oil is not recommended for vaping, so the best way to take it is orally. The recommended dosage is to use about half of the dropper. You place this under your tongue and hold it there for a few moments before swallowing. Immediately, you are hit by the incredible flavor. Whoever associated vanilla with plain and boring definitely had not tried this as the taste is delicious. It has none of the bitter aftertaste you get with some CBD oils, just pure sweet vanilla (but not too sweet!). PureKana makes the flavoring with actual vanilla beans, so this amazing flavor is 100% natural, which is good to know. The actual quality of the oil is not in doubt either as PureKana grow their hemp in specially selected microclimates in countries that are hemp-friendly on family run farms. Not only do they have outside labs test the products, but they test the actual soil the hemp is grown in too. All seeds used are cold pressed and as we mentioned before, they make it a point of pride that no nasty chemicals are sprayed during the growing of the hemp. Their extraction process employs CO2 for an advanced full-spectrum extraction process and is quality tested. Their lab results show the final oil product is 99% pure – Heisenberg levels! There are few other hemp CBD companies who go to this much effort to ensure the quality, but it really, really shows in the final product. This Vanilla oil is top notch. The effects kick in fairly quickly and for me, the biggest notice was my anxiety subsiding. I also sometimes suffer from joint pain in my knees and although this didn’t completely disappear, it did dull the pain considerably to the point where I didn’t actually notice it at all. At this measurement of 300mg, I would say it is an absolutely perfect treatment for anxiety and acute pains such as mine. PureKana says their CBD oil can be used to treat a whole range of other different medical conditions including inflammation, insomnia, pain, stress relief, arthritis and diabetes. The CBD oil is made from hemp. Hemp is part of the cannabis family but contains only minute traces of THC. THC is the active ingredient in cannabis which gives it its psychoactive properties. As this oil is made from hemp with next to no THC (0.02%), it has no psychoactive properties. This basically means it will not get you high. Also, you don’t have to worry about the legality, as part of the third-party lab checks is to ensure the trace amounts of THC are never too high to make the oil illegal. This PureKana CBD oil isn’t the cheapest, but it isn’t the most expensive on the market either. With a pricing of $54 for 1 oz (30 ml), it sits comfortably in the mid-range price market. Each bottle should get you 40 servings if you use the recommended dosage. To be honest, that is an absolute bargain. Here you have a top-quality product at a price that doesn’t break the bank. We find that you really do get what you pay for with the cheaper brands and this is a high-end product at a more than reasonable price. Definitely worth paying a little bit more extra for the best. Effective treatment for a range of medical problems such as pain, anxiety, insomnia, arthritis, stress relief, diabetes and inflammation. Although effective against a range of problems, it is not suitable treatment for more debilitating disorders such as schizophrenia. Individual differences. Everyone is different and although this oil was super effective for us, it might not work for everyone.